California oil and natural gas production is declining even as the state’s demand for fossil fuels is increasing. This is the wrong direction for a state with abundant hydrocarbon resources as well as the nation’s strictest environmental regulations. Nevertheless, a group of more than 100 local elected officials across California urged Governor Jerry Brown to phase out fossil fuel production in the state. Ostentatiously dubbing themselves “Elected Officials to Protect America,” these officials – most of whom signed the letter symbolically as they hail from areas of the state without oil and natural gas operations — asked Brown to stop issuing permits for new fossil fuel projects. In fact, California should be producing more oil and natural gas at home, not less, to meet our citizens’ and our economy’s increasing need for energy, to demonstrate leadership in mitigating global climate change, and to provide more energy security. California’s population is, for the moment, increasing, on target to hit 40 million this summer, larger than Poland, Iraq and Canada. We are the fifth-largest economy in the world, larger than the United Kingdom, India and Brazil. California is also the third largest consumer of gasoline and diesel on the planet, behind only China and the United States as a whole. 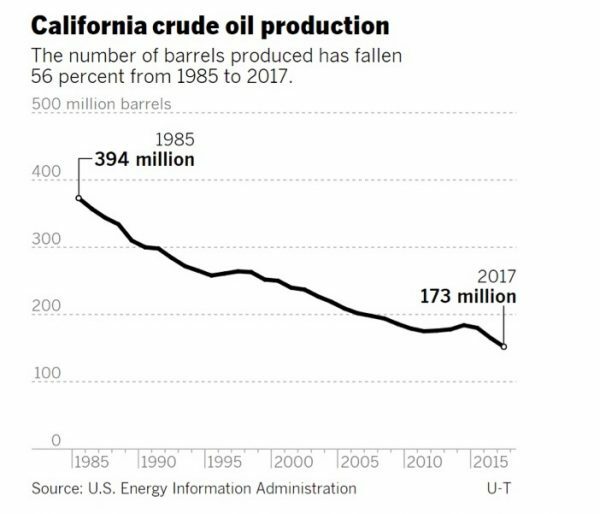 But despite the growing need for fossil fuels in the most populous state in the nation, California’s ranking as a top oil producer has been on a rapid decline. It’s common sense that oil and natural gas production should be encouraged in a state of California’s size and economic influence, especially when, as previously noted, we have the necessary natural resources under our feet and regulations to protect our environment. When Governor Brown said this, California was the third-largest oil producing state and he believed that it was critical for the Golden State to maintain its leadership as an energy producer while simultaneously leading the charge to mitigate global climate change. Though he was often attacked by the left fringe of his party and by activist groups who wanted to shutter the industry completely, Brown spoke against attempts to demonize the routine, safe practice of hydraulic fracturing (fracking) and instead signed a bill, SB 4, putting the nation’s strictest regulations on the practice. SB 4 complemented other rules and regulations that, while they are sometimes overreaching and onerous on producers, make California by far the most regulated oil and natural gas state in the country, something environmental activists, if their goal truly is to reduce carbon emissions, should celebrate. Despite California’s demonstrated success in climate leadership, and the energy industry’s demonstrated success in safe and compliant operations, oil production has not boomed in California as it has elsewhere in the country. California has slipped to sixth in oil production and we are about to be overtaken by Colorado. Meanwhile, if it were a country, Texas would be on track to surpass Iraq and Iran to become the third largest oil producer in the world next year, behind only Russia and Saudi Arabia. As they do every so often, industry opponents like the signers of the recent letter are calling for California to abandon its energy leadership and to produce even less oil and natural gas than the state produces today despite our growing population and demand for energy. This kind of activism might make elected officials feel good, and it might play to the more extreme elements of their voting base, but it betrays a lack of understanding about the role that energy development plays in California’s economy, the way energy sources – renewable and fossil fuel – work together to power different aspects of our lives, and about the way the global climate system actually works. Activists and elected officials alike seem to have forgotten that the robust, century-old oil and natural gas industry is a big part of what has made the state the cultural and economic superpower that it is today. They have failed to consider the vast economic and environmental impact that would follow such a decision. For starters, energy production drives the state and regional economies. In June of 2017, Governor Brown declared it was “grossly hypocritical” to oppose oil production in California. After all, the state has the highest demand for gasoline in the country and is (still) one of the highest producing states in the U.S.
Let’s break down the numbers. There are nearly 40 million people in California, 26 million passenger vehicles and light trucks, and over a million transport trucks. All of that adds up to 48 million gallons of gasoline and diesel consumed per day — or 2.5 million gallons every hour. Consumption requires production and we – as noted above, as the third- largest gasoline and diesel market on Earth – must import oil that we don’t produce at home. If fact, at present we can only produce 38 percent of the oil Californians themselves use; the rest – 72 percent of the oil Californians use every day – has to be imported by rail or boat from other states or countries with laxer environmental protections. If California stopped producing oil, replacing what we use each day (and, remember, wind and solar don’t replace oil at scale) would mean welcoming 588 more tankers each year to our major harbors, or almost 300,000 more rail cars in our rail terminals. These transportation options have a larger carbon footprint than producing oil at home. So, if the elected officials calling for a stop to oil production have their way, global carbon emissions will increase, not decrease. And it should trouble all Californians, including the public officials signing the letter to the Governor, that in 1997 we imported 12 percent of our oil from foreign countries and 58 percent in 2017 — a four-fold increase in only 20 years. This is a potential disaster for California’s energy security given that we are an energy island with no interstate pipelines. California oil production has obvious economic benefits as well. According to the Western States Petroleum Association (WSPA), the industry accounted for $148 billion in total economic activity in 2015. In other words, the industry was responsible for 2.7 percent of California’s total GDP, supporting more than 368,000 jobs. WSPA noted that jobs linked to petroleum represent 11.1 percent of employment in California and more than $187 billion in labor income. More in-state production, in addition to reducing our global carbon footprint and increasing our energy (and our national) security, would increase jobs and economic activity just as reductions in production would curtail them. Ignoring the simple fact that demand for oil will continue to rise for at least the next several decades, anti-energy activists and their allies in elected office persevere in attempting to hamper California’s oil and gas industry from providing the energy that the Golden State needs. Over the past 10 years, every facet of the oil and natural gas industry in California has been targeted by the dozens of new bills and regulatory rule makings. Thankfully, we don’t have to choose between energy leadership and environmental leadership. California has always been at the cutting-edge of progressive environmental policy, and that isn’t going to change. The state supports renewables, like the largest solar plant in the U.S. – and will soon boast an even bigger one, being built by an oil and natural gas company. But California has also always simultaneously acknowledged the necessity of petroleum products and has reaped the benefits of having a home-grown industry that works with policymakers and regulators to meet and exceed the most ambitious environmental goals in the nation. The oil and natural gas industry supports a diverse workforce earning good wages, contributes to the California’s robust economy, and provides the staggering amounts of fuel necessary for state-wide demand and helps provide a measure of energy security. At the end of the day, Governor Brown and his successors would be foolish to put any of these things at risk.